It is no secret that Iran has been a major provider of funds and arms for terrorists in the Middle East and other areas in Asia and Africa. The Iranian nuclear treaty does not seem to have slowed their arming of terrorists or their belligerent attitude. Yesterday Fox News reported that a U.S. Navy ship stopped a shipment of arms going from Iran and likely headed for Yemen. 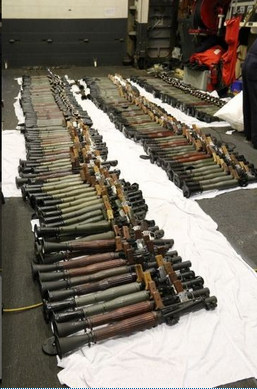 After the U.S. seized the weapons stash from the dhow, a traditional sailing vessel, the Navy let the crew go. A U.S. official told Fox News current rules do not allow western naval forces to seize the crew in addition to illicit cargo. “You have to find a country willing to prosecute,” the official said. A defense official reached by Fox News would not reveal the nationality of the dhow’s crew. Last month, Iran announced that it tested missiles marked with the phrase “Israel must be wiped out,” in violation of a U.N. Security Council resolution tied to the recent nuclear deal. The resolution forbids Iran from working on its ballistic missile program for eight years and bans sales of its conventional weapons. It is becoming very obvious that the only reason Iran was even willing to negotiate the recent nuclear deal was that it wanted the economic sanctions lifted. It is also becoming very obvious that even stricter sanctions need to be imposed. Iran is acting as a major supporter of terrorism. That needs to stop. Allowing Iran to continue arming terrorists and building a nuclear program to wipe out Israel is simply the suicide of western civilization. To allow Iran to continue its present behavior will have horrible consequences in the not-to-distant future.